Some ‘firsts’ you may not know about Northampton and District Indoor Bowling Association. We were the first indoor bowling club in Northampton. We were the first eight rink club in Northamptonshire. The first indoor bowling club to have the bar facilities available for the whole of the time we are open. Once again the whole club pulled together and had a gala day raising £5,000 which enabled us to purchase 5 special indoor bowling wheelchairs to be used by members who already use wheelchairs or by those members who have problems bending down. Another first! The first indoor bowling club to purchase one of the new defibrillators used to help save the life of anyone suffering from heart failure. Don’t worry we also have several members and bar staff trained to use them. 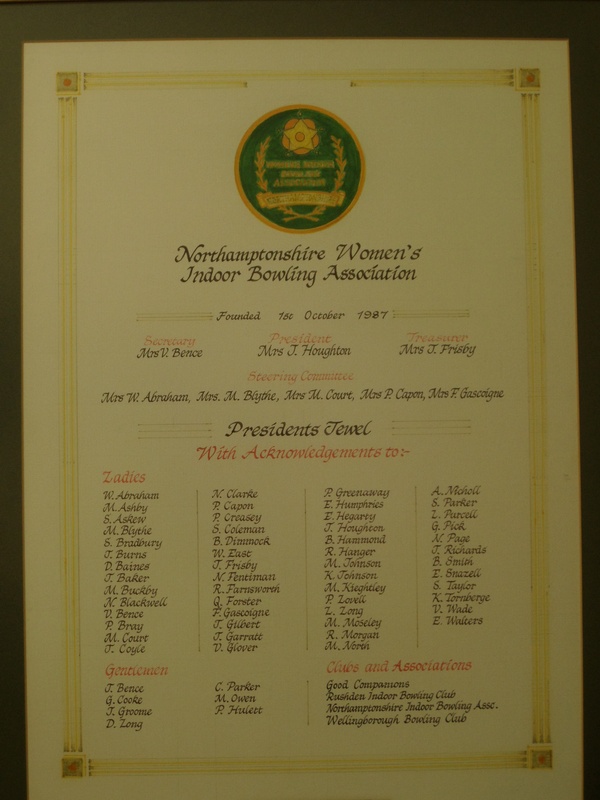 A Plaque called ‘THE JEWEL‘ was presented to this Club in honour of the formation the N.W.I.B.A. and is hanging proudly in the entrance to the Club. On October 1st 1987 a meeting was held at the club attended by representatives from all of the Northamptonshire Ladies Indoor Bowling Clubs. The outcome of this meeting was the decision to form the Northamptonshire Women’s Indoor Bowling Association ( N.W.I.B.A.) more commonly known as County Ladies. It was also decided to make this Club, Northampton and District Indoor Bowling Association, the home of the N.W.I.B.A.